Healthy eating can happen with one step at a time. It can be simple! The U.S. Department of Agriculture has released a new initiative to help consumers meet their health goals. 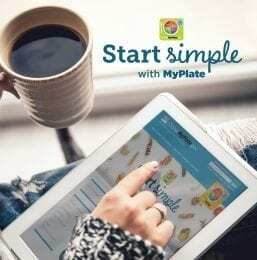 It is called Start Simple with MyPlate. Focus on whole fruits. Add fruit to a bowl of cereal for breakfast or grab one for an easy snack. Don’t forget that canned and frozen fruits are great choices when your favorite fresh fruit is not available. Vary your veggies and think colorfully! Dark green, red, orange, yellow and other colorful veggies add lots of good nutrients to any meal or snack. Prepare extra veggies for a side dish or to use in soup or pasta. Make half your grains whole grains. This message still holds true! Choose 100% whole grain bread, pasta, crackers, or cereal. Vary your protein routine. Meat, poultry, fish, seafood, legumes are beneficial. Don’t forget to serve veggies and whole grains with your protein choice! Low-fat or fat-free dairy foods compliment any meal. Be a role model for kids to show dairy foods are healthy! 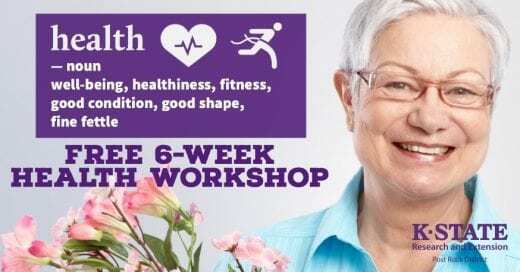 If you are living with an ongoing health condition (such as arthritis, asthma, diabetes, high blood pressure, or depression) or you are a caregiver of someone who does, this is for you! Living with Chronic Conditions workshops are interactive learning opportunities that teach techniques to manage common symptoms. Contact Smith County Health Department at 785-282-6656. Registration deadline is February 15th. Stay Strong, Stay Healthy coming to Lincoln! Have you been wanting to make your health a priority? Now is a great time to do just that! Registration is now open for the upcoming older adult strength training program Stay Strong, Stay Healthy. Strength training is especially important in older adults and can improve balance, strength, flexibility, and quality of life. Two classes will be offered, one from 2-3pm and 3:30-4:30pm. We will meet on Mondays and Wednesdays beginning February 20th and ending April 15th. The sessions will be held at the Lincoln Senior Center. Cost for this program is $20, but there are financial scholarships available. Registration is required, and you can do so by visiting our office in Lincoln or by calling (785) 524-4432. Feel free to contact Ashley, the instructor at asvaty@ksu.edu with any questions about the program. 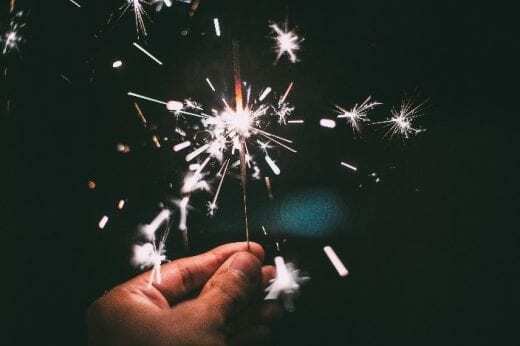 As 2018 comes to a clo se and you look toward 2019, we encourage you to focus on improving your health and wellness. 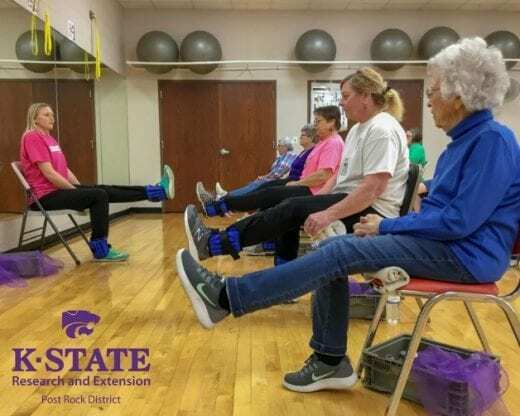 K-State Research and Extension has a great resource, Action Plan for Health Living, which can help you set goals throughout the New Year that can truly enhance your quality of life. 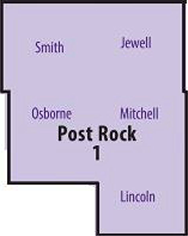 Remember to reach out to the Post Rock District Agent Team as you work toward your goals. We are happy to assist and support you! If you have a technology related item near the top of your holiday or birthday wish list, you’re not alone. Many adults and children ask for some form of technology which might be a tablet, TV, smart phone, video game, etc. Although these forms of technology might sound great and are okay to use every once in a while, too much sedentary behavior and screen time negatively impacts health in numerous ways. 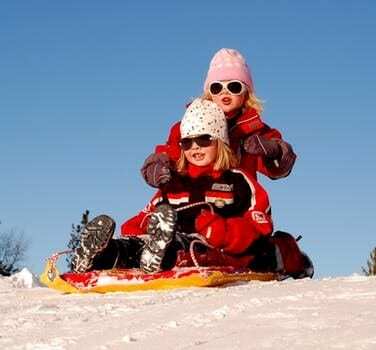 Before making a purchase that will encourage more screen time and sitting, consider giving a gift that will keep kids and families active throughout the year! Family membership to a fitness center, children’s museum, or zoo. Stay Strong, Stay Healthy coming to Smith Center! Have you been wanting to make your health a priority? Now is a great time to do just that! Registration is now open for the upcoming older adult strength training program Stay Strong, Stay Healthy. Strength training is especially important in older adults and can improve balance, strength, flexibility, and quality of life. We will meet on Mondays and Wednesdays beginning October 22nd-December 19th from 9:30-10:30am. The session will be held at the Srader Center in Smith Center. Cost for this program is $20, but there are financial scholarships available. Registration is required by October 19th, and you can do so by visiting our office in Smith Center or by calling (785) 282-6823. A minimum of six participants is required. Feel free to contact Ashley, the instructor at asvaty@ksu.edu with any questions about the program. Stay Strong, Stay Healthy coming to Downs! Have you been wanting to make your health a priority? Now is a great time to do just that! Registration is now open for the upcoming older adult strength training program Stay Strong, Stay Healthy. Strength training is especially important in older adults and can improve balance, strength, flexibility, and quality of life. We will meet on Mondays and Wednesdays beginning September 21st- November 21st from 2-3pm. The session will be held at the Zion Lutheran Church in Downs. Cost for this program is $20, but there are financial scholarships available. Registration is required, and you can do so by visiting our offices in Osborne or Beloit or by calling (785) 346-2521. Feel free to contact Ashley, the instructor at asvaty@ksu.edu with any questions about the program.